The main antagonists of your oral health are bacteria. While they are always present, if foods high in sugar are consumed in abundance or there are inconsistencies in performing oral hygiene, plaque can eventually develop and begin to seep beneath the gumline. What Makes the Gums Bleed? One of the reasons that gums bleed is that as plaque works its way beneath the gumline, it forms pockets that trap germs. As a result, the gums become irritated, which leads to them easily bleeding. 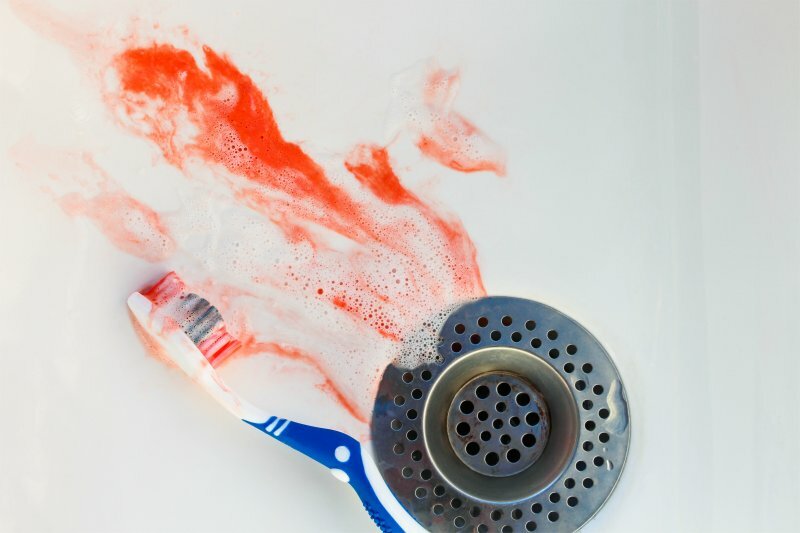 Another contributor to bleeding gums can be vigorous tooth-brushing. Age – Unfortunately, the older you get, the more susceptible to gum disease you can become. Stress – Studies show that increased stress can weaken your body’s immune system and leave you vulnerable to developing periodontal disease. Medications – Certain medications can cause your mouth to become extremely dry, which is the optimal environment for bacteria to grow. Genetics – Due to your family history, you may have a greater chance of developing periodontal disease. Thus, any warning signs shouldn’t be ignored. Thankfully, there are several methods for treating periodontal disease. They are classified into two basic categories – surgical and non-surgical. Root Planing and Scaling – Typically used to treat moderate-to-advanced forms of periodontal disease, root planing is the process of smoothing the surface of the roots to prevent them from attracting new bacteria. Scaling, then, is used to remove plaque and tartar that has become trapped beneath the gums. Periodontal Maintenance Therapy – For some patients, it’s necessary to undergo maintenance therapy to prevent the re-occurrence of periodontal disease. The specialist will develop a personalized plan that typically suggests that the patient visits every three-to-four months instead of the usual semi-annual schedule. Pocket Depth Reduction – As bacteria move beneath the gum line, the ligaments and bone that hold your teeth in place can be compromised. A pocket depth reduction involves the removal of infected tissue, which allows for new, healthy tissue to grow in its place. Regeneration and Bone Grafting – Over time, untreated periodontal disease can lead to a loss in bone mass. The bone grafting procedure will remove healthy bone from other parts of the body so it can be used to restore the bone material beneath your gums. Soft Tissue Grafting – This procedure is used to replace severely decayed tissue with healthy tissue from other parts of the mouth. Osseous Surgery – Another method your dentist has to overcome lost bone material is to perform osseous surgery, which can include the reshaping or replacement of bone tissue. Overcoming periodontal disease is possible with the help of your dentist, but the first step is to schedule a consultation. Then, by being more proactive, you can possibly receive a less-invasive form of treatment to restore your oral health. To also help in reducing the occurrence of bleeding gums, you should be sure to use a toothbrush with soft bristles, and carefully brush your teeth. By taking the safest approach and receiving the expert care of your dentist, you can soon have healthy gums. Dr. Marvin Berger is a graduate of the Columbia University School of Dental and Oral Surgery. Additionally, he received a Certificate in Periodontology from the Boston University School of Graduate Dentistry. A member of the American Academy of Periodontology, Dr. Berger helps patients overcome periodontal disease at Flenniken Family Dentistry, and he can be reached for more information through his website.